There’s something familiar about Busan. 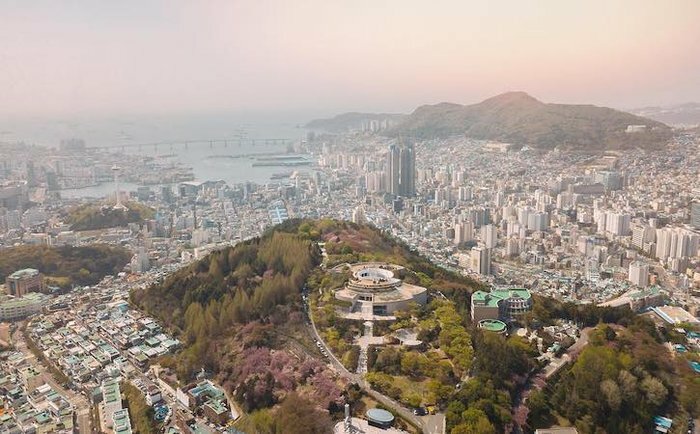 Perhaps it’s the skyscraper-backed beaches reminiscent of Rio de Janeiro or the suspension bridge stretched across the bay that recalls San Francisco — or the distinct South Korean culture that reminds you of a more laidback Seoul. But Busan brings an energy all its own. Mountains and beaches, hot springs and city streets, this port city has a ton to offer. And with a mix of traditional and new, it’s not hard to see why this gem draws thousands of visitors each year. 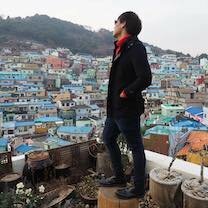 Busan is the second-largest city in South Korea, and it was one of only two cities not invaded during the Korean War. 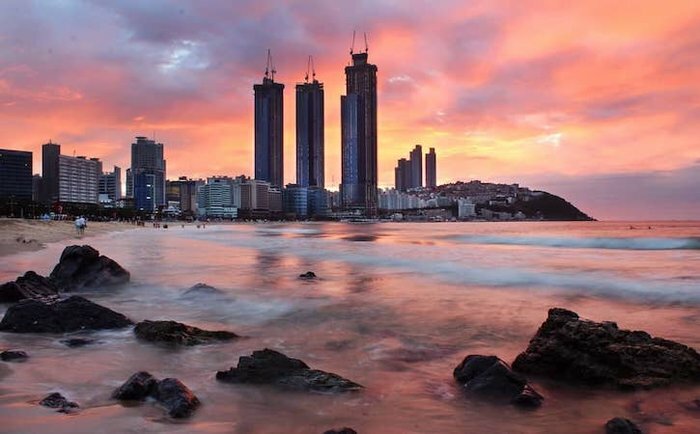 Don’t let the bright lights fool you — Busan is definitely a beach town. Visit during the spring and summer for warm sunny days without too much humidity. The late spring also sees many festivals, though the biggest takes place in September, with the Busan Film Festival drawing hundreds of patrons from across Asia. 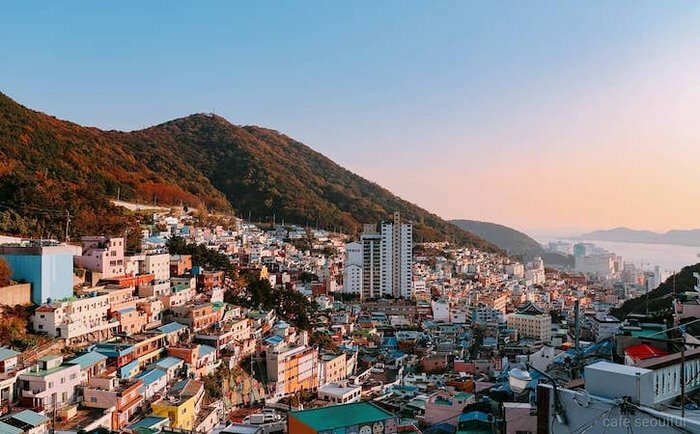 While the skyscrapers and bright lights might fool you into thinking Busan is all about modernity, you can’t make a visit without honoring the region’s past. This means adding stunning temples, fortresses and villages to your sightseeing list. 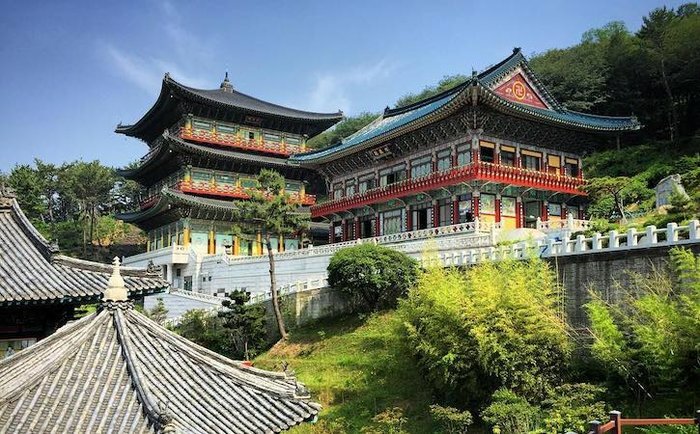 From the Haedong Yonggung Temple, set in the cliffs above the sparkling ocean, to the Beomeosa Temple up in the mountains, there are several places to quietly reflect on the region’s beauty. 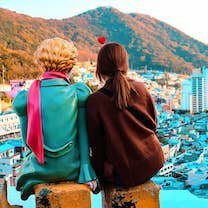 Also worth adding to your list is the Gamcheon cultural village — a colorful town in the mountains with winding alleys and whimsical street art. Perched next to the bustling city skyline, Busan’s beaches are the place to be no matter what time of day. Walk the quiet sand in the morning, splash in the water in the afternoon and meet here for sunset drinks at the hopping clubs and bars that line the boardwalk. Haeundae Beach is by far the most popular and accessible, but nearby Gwangalli Beach is equally beautiful and much calmer. 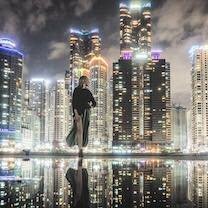 Head a bit further from downtown to Songdo Beach for another secluded spot and catch the skytram over the water to enjoy the waves from above. 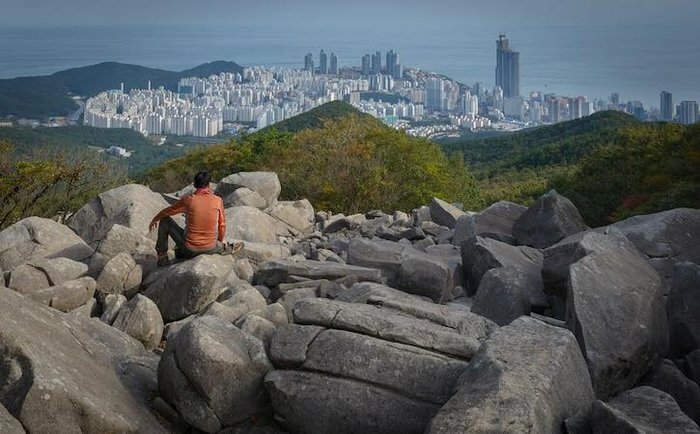 Nestled in the mountains, Busan has access to some rugged trails that offer impossible-to-beat views of both city and ocean. 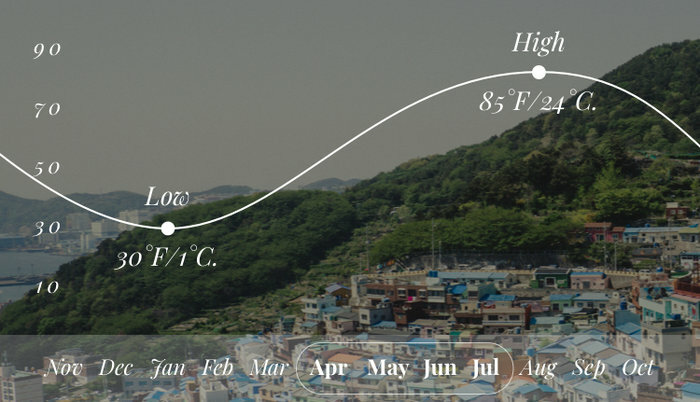 Take the cliffside hike up Taejongdae Park for lighthouses, temples and sea air. 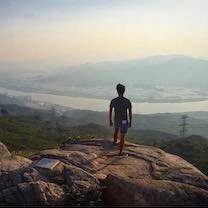 Or explore Jangsan Mountain and Hwangnyeongsan Mountain to capture aerial views of Busan. After your adventures, soak your feet in one of Busan’s many famous spas and hot springs. Spa Land is one of the most popular — a state-of-the-art jjimjilbang (Korean spa) complete with hot springs, saunas and themed bathing rooms. Spa Land can get a little overloaded, so if you want something more private visit Cimer Spa, only accessible to guests of the Paradise Hotel. The 12 themed outdoor hot springs will give you those same stunning views while you relax away your worries. 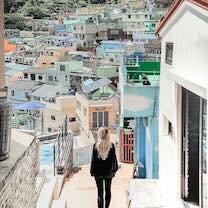 You can’t miss hopping around the big city streets in Busan and exploring food stalls, restaurants and boutiques. 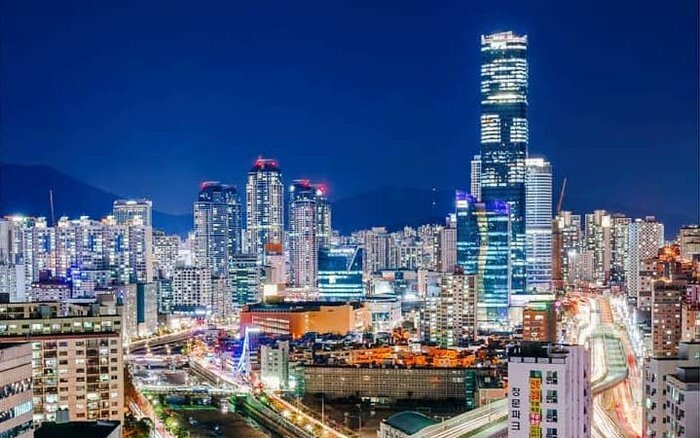 From the commercial center Seomyeon and its underground shopping center to the touristy BIFF Square, former home of the Busan International Film Festival, there are plenty of shops and restaurants for all budgets and tastes. If you haven’t had enough, spend a whole afternoon at Shinsegae Centum City, the largest department store in the world, according to Guinness. For a quieter shopping street, peruse the stalls at the Busan Book Alley, whose every nook, cranny and storefront is packed with books of every language and genre. 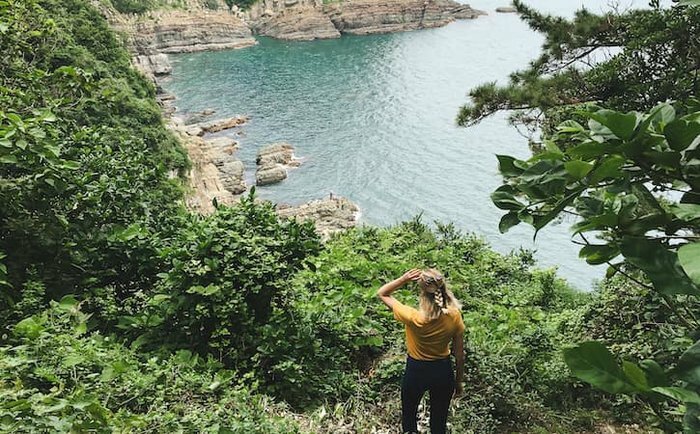 "Busan has a few different coastal walks that follow the shoreline up and through cliffs and forest. The boardwalks make for a pleasant walk with pretty views of the ocean. This trail starts at Songdo Beach and winds a few kilometers up the coast. 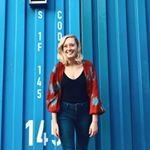 Songdo Beach is also a good area to explore and I recommend enjoying the short stroll along the Songdo Skywalk before going to Amnam Park." 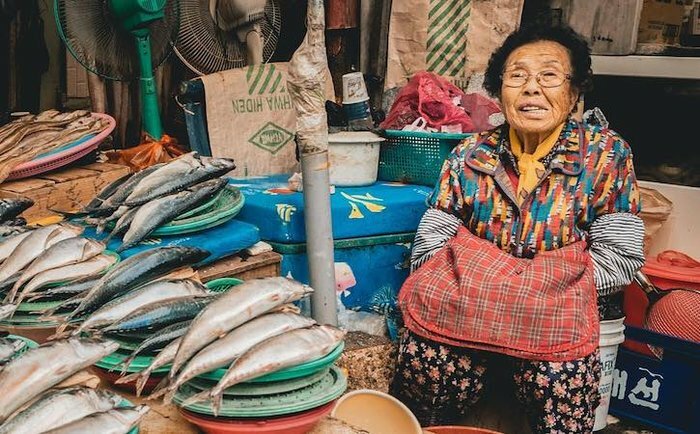 Settled right on the water, this port city is renowned for its seafood, and the best can be found at Jagalchi Fish Market. Every kind of slimy, scaly fish can be found within these stalls, and once purchased you can take the ingredients upstairs to one of the many restaurants to have them prepare it for you. Also worth visiting is the Gwangbokdong Food Street for an assortment of food stalls and restaurants for inexpensive prices. If you want a sit-down meal, head to the closest seaside restaurant in Taejongdae Jagalmadang and order jogae gui, a smorgasbord of the best shellfish on offer that you get to cook yourself. Accommodations are limitless in Busan, no matter your budget or style. 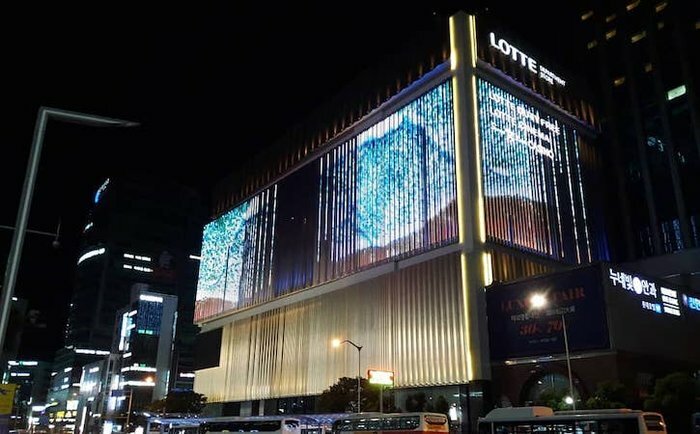 Luxury seekers should stay at the Lotte Hotel, an upscale establishment in the heart of Seomyeon. If you’d rather stay near the beach, opt for the views at the chic Kent Hotel near quiet Gwangalli Beach. 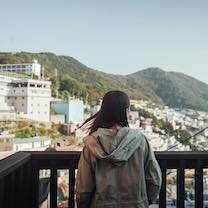 Finally, for budget-conscious visitors, try one of the city’s many clean and minimalist guesthouses, like the Good Day Mate Guesthouse near Haeundae.